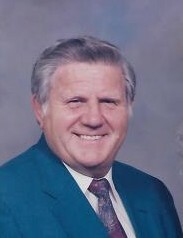 Mr. James (Jim) Martin George, 87 of Bamberg, SC passed away Monday, January 21, 2019. Funeral services for Mr. George will be held 3:00 PM Thursday, January 24, 2019 at Zion United Methodist Church 6614 Farrells Road Branchville, SC 29432 with Rev. Billy Mew, Rev. Chris King, Alvin Jeffcoat officiating. Burial will follow in Church Cemetery. He was born in Charlotte, NC on December 29, 1931 to the late Marvin G. George and the late Sallie Mae George. He loved his family, friends, and truly loved and adored his 5 grandsons. He worked at Savannah River Plant for 39 years, served in Korean War, farmed, owned his own picture framing business, loved his horses and was an avid cowboy. He was a Sunday school teacher and was on the Board of Voters Registration. He was a member of Zion United Methodist Church and attended Hunters Chapel Baptist Church. He is survived by his wife of 65 years Betty Jo Rhoad George, one daughter Diana (Nick) Saitz, one son Mike (Jennifer) George, 5 grandsons Gerhard Varn, IV, Martin Varn, James George, Michael George, Jack George, one sister Francis Connelly, one brother Johnny (Lee) George and a number of nieces and nephews. He was predeceased by one brother Bill George. Pallbearers will be Gerhard Varn, IV, Martin Varn, James George, Michael George, Jack George, and Nick Saitz. Memorials can be sent to Zion United Methodist Church in care of Richard Rentz 5939 Farrells Road Branchville, SC 29432 or Zion United Methodist Church Cemetery in care Betty George 4976 Farrells Road Branchville, SC 29432 or Hunters Chapel Baptist Church 9375 Hunters Chapel Road Bamberg, SC 29003. The family will receive friends Wednesday, January 23, 2019 from 5:30PM until 7:30PM at Cooner Funeral Home. Cooner Funeral Home, LLC, (www.coonerfuneralhome.com) 287 McGee Street Bamberg, SC 29003.